Hi Friends: Today I'm showing my first card for the release of the new Yorkshire Terrier stamp set from JessicaLynnOriginal stamps. This stamp set is just adorable - it reminds me of the cute little dogs that ran around in the neighbor's yard when I was growing up. They used to run up and down the fence whenever we played out back - they were so cute and I always wanted one. Visit all of my design teammates and see what else they've done with this adorable stamp set. Don't forget, if you decide to purchase any stamps or digis from the store, please remember to put my name in the instructions/comments section during checkout. For full details of how to create this card, see my instructions and supplies listed below. Thanks for joining me for the release of this great new stamp set! Happy Crafting! Stamp focal image onto smooth white cardstock using Memento Tuxedo Black ink and color with Spectrum Noir markers. Add some glitter brush pen to the metal elements on the collar and some Glossy Accents on the eyes and nose. Die-cut image using pierced squares die and frame with a panel of Shimmer cardstock. Using the MME papers, cut background paper to fit A2 card base and stitch edges with sewing machine. Ink edges, wrap with baker's twine and glue to card base. Cut additional coordinating papers from the card pack - use the next larger pierced square for 1 panel and a smaller cut piece for a second panel. For the larger panel, create some texture with an embossing folder and highlight the raised portions with silver Inka Gold. For the smaller panel, add texture with sewing machine, then wrap with baker's twine. Glue larger panel directly to card base, under the twine. Add smaller panel with foam squares. Add paper clip to focal panel and add to card base. Thread button with baker's twine and add to card. Cut banner from "Adorable" sentiment in the card pack and add to top of card with foam squares. 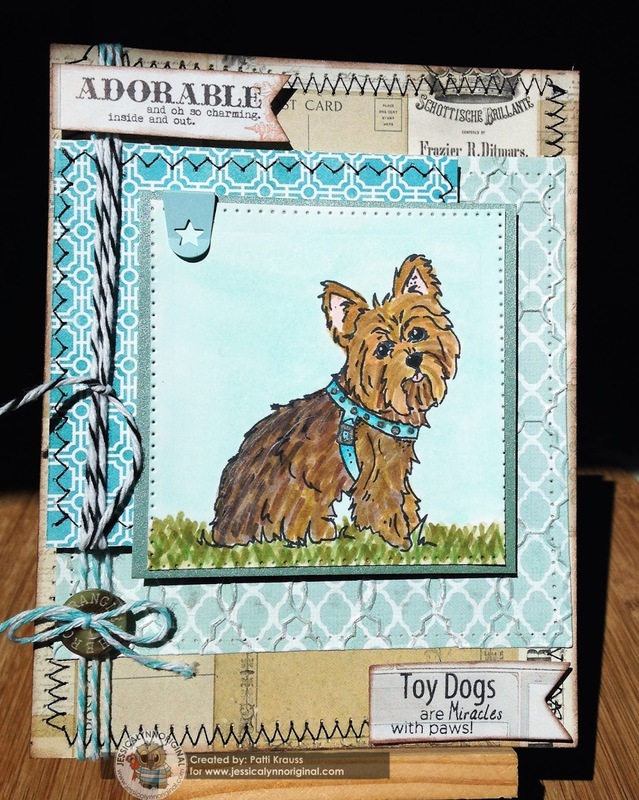 Finish by stamping the "Toy Dogs" sentiment onto coordinating paper, cut with banner die, and add to bottom of card with foam squares.